As marketers we need to adapt our tactics to capitalize on this change and meet buyers online. Fortunately, the intersection of SEO, social media and content provides that opportunity and we can leverage these tools to help guide the buyer through their buying cycle. I believe we’ve all heard the phrase “Content is King”. In B2B marketing this has never been truer than it is today. We like to think about it as, “Quality content is King”. Due to attention scarcity and vast amounts of information, it is paramount that the content produced is relevant to the buyer and the stage they are in during the buying cycle. To best understand what this means, let’s explore how content plays a role in each segment of the buyer life cycle. Awareness. Content marketing contributes to the development of brand awareness by helping buyers find your product or service online through search and/or content syndication. Consideration. This is the stage where you can position your company as a thought leader and educate the buyer on your value proposition. In B2B marketing, the buyer needs to see how your product or service solves their problem and will provide a return on their investment. Your blog, website and social media sites like LinkedIn and Google +, are great platforms to help distribute this content. 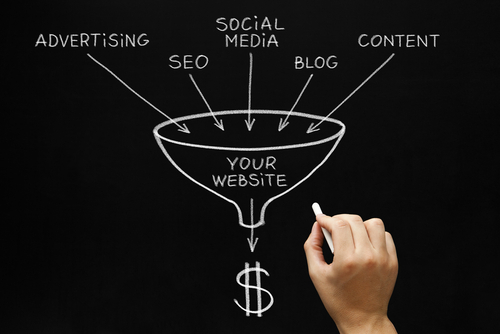 The content produced will also help to provide strong search rankings and boost your creditability. Purchase. Once you've gained customer’s trust and respect, we move into the purchase stage. During this stage, it is important to analyze the effectiveness of your content. We do this by tracking sales paths and seeing which content helped the buyer in their journey. We now have the ability to track everything, but we need to make sure we use this data to make better marketing decisions in the future. Service. Providing quality content is important for the overall customer experience. Providing quality thought leadership through digital press releases or your blog can help to educate your customers about your organization. Your customers can stay informed about advances in your product and services. Loyalty. Publishing content through newsletters, webinars, and articles are all great ways to strengthen the relationship between your brand and the customer. Engage your current customer base through social media sites or webinars to deepen the relationship. These customers, if nurtured properly can be great advocates for your organization. Advocacy. There is no better marketing than content coming from a trusted source. Let your customer baseshare your content and promote your brand. This will lead to great referral business and strengthen relationships even further with your brand advocates. Content plays a huge part in every segment of the buying cycle. It is much more than just a way to attract leads for the business development team. If approached correctly, in a holistic manner content can provide much more return for your organization. So the next time you are writing a case study or white paper take a step back and think about the six stages of the buyer’s lifecycle. Ready to get started on your content strategy? Download our Content Strategy Guide to start building your content marketing plan.